Over the weekend the temperature hit 60, and now my spring fever is official. I haven't done much spring-wardrobe planning just yet (it's been too cold before now!) but there are a few things that have been on my radar. Here's what I've been wish-listing lately. 1. Striped dress. My beloved striped dress of years past is in need of a replacement. I may not be ready to part with it just yet, but I think I need to give it a break. I'd love a lightweight version like this Steven Alan one that looks equally ready for some layers or simply a bright pair of sandals. 2. Distressed jeans. Call me crazy, but I'm considering giving my much-loved boyfriend jeans an update. Right now I'm craving a pair that's a little less distressed and a little slimmer in fit. I love this pair from Loft. 3. Print top. Spring makes me want to add both bright color and more prints to my life. This top, which has a little of both, is just what I had in mind. 4. White sneakers. The other day I found a pair of Tory Burch perforated leather sneakers that I fell for, and I've been determined ever since to find a budget pair. This slip-on pair from Steve Madden may be a little different, but I think they would still scratch the itch. 5. Bright, light cardigan. 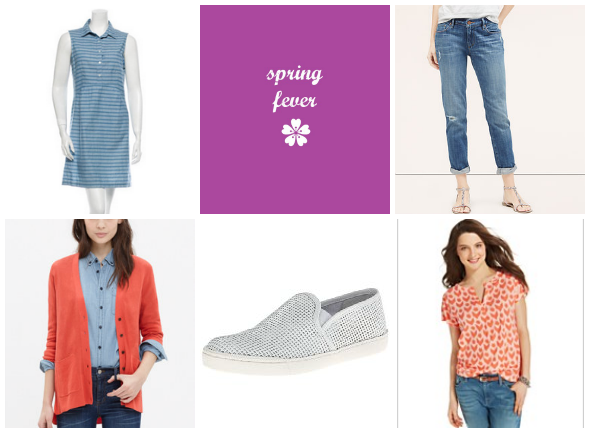 Lightweight cardigans are a must for spring, and I'm really craving some color. I love this pretty coral one from Madewell. 5 years ago: layering lots of neutrals. 3 years ago: making pork chops with wine and garlic. 1 year ago: polishing a graphic tee. I want about a thousand striped dresses for summer! I have 5 pairs of boyfriend jeans that I never wear because they are only kind of close to being perfect. I'm sure i'll buy 5 more before I find the right pair! I want that striped dress too! I also love that printed top! I think topping my list is a new pair or two of the pixie pants from Old Navy in their updated floral and pastel colors! that print top is adorable. and i need one in every color. I'm really liking the coral and light denim theme I see going on here. Does this mean you're doing a spring capsule? Since we have fairly similar styles and wardrobes, I can tell you that you will for sure get tons of use and love from a pair of jeans like that. I LOVED how my lighter/slightly distressed jeans added a little edge to basic outfits in the fall, and they're so great for doing fancy/casual. Didn't include them in winter because they look best for bare ankles, so now that I get to pull them out again it almost feels like having a brand-new item in my closet - yay! Also yes to sneakers! Target has some cute perforated ones right now too, though only in the slip-on style as well I think. Old Navy is another great place to check. Ha! I feel like that's always the case for jeans in general. I'm always on the hunt for perfect jeans and also have several pairs of almost-there-but-not-exactly jeans. If you ever find the perfect pair, let me know! I think I'll be making a stop at Old Navy for sure! I didn't think about a spring version of their pixie pants--I may *need* those as well! You know, the color scheme was unintentional, but I seem to be drawn to those colors right now. And yes, I'll be doing a spring capsule (it may be my last, we'll see). I need to get planning! Ooh thanks for the Target tip, I'll have to check out their slip-on sneaker selection. Some of these I can be more flexible with, but I am DETERMINED to find some cute white perforated leather (or faux) sneakers/slip-ons. Oh, and last thing, yes, I love the feeling of pulling out something I love that I put away for a while. Like my white jeans, I'm SO stinkin' excited to wear those! Thanks Tina! A striped list is definitely one of the things at the top of my list--I know I'll wear it all the time! Pinterest-inspired Photo Display - 1000th Post! Shea Lennon: Past, Present, Future.